The NFL’s biggest game, letdown, upset, and surprise of week 2? > News > The NFL’s biggest game, letdown, upset, and surprise of week 2? Week two is now a wrap, and another great week of football is now in the books. Starting off we have the Kansas City Chiefs going into Cleveland to take on the Browns. After a surprise win over the Chargers last week, the Chiefs showed up again and beat the Browns 16 to 14, which is their first 2-0 start since 2005. Second we have the Dallas Cowboys hosting the Chicago Bears. A lot of people think the Cowboys have what it takes to not only make it to the Superbowl, but win it. The problem is that a loss to their arch rival Redskins last week and a 27 to 20 loss against the da Bears doesn’t exactly start them off in the right direction as they are now 0-2 while the Bears move to 2-0. But, like I’ve said before…Tony Romo is going to have to do more than Jessica Simpson to take his team to the Superbowl. Okay, so on to Tennessee…the Titans took on a Steelers team that is still without Ben Roethlisberger so Vince Young and his boys had a chance. Except for the fact that the Titans commited 7 turnovers and sat Vince Young due to his poor play. That’s when the Titans turned to veteran QB Kerry Collins, and they made it interesting in the final minute as they tried to tie things up. But once again, the Steelers defense shut the Titans down and Pittsburg improved to 2-0. Next, we had the Minnesota Viking hosting the Miami Dolphins. After losing to the Saints in New Orleans last week to kick off the NFL season, you had to think the Vikings were going to easily take care of the Dolphins in this one. However, the Dolphins proved to be too tough as Brett Favre threw 3 interceptions and committed 1 fumble as Dolphins took down the Vikings in Minnesota 14 – 10. On to the Meadowlands…the trash talking Jets hosted the Patriots and although this one didn’t make my list, it’s still my rivalry of the week. I definitely thought the Patriots would win this one 30 to 17…but apparently the Jets had other plans and took down the Patriots in the Meadowlands 28 to 14. So here’s one for you…Houston, we (DON’T) have a problem. After upsetting the Colts last weekend, the Texans took on Donovan McNabb and the Washington Redskins. I thought last week the Texans just got lucky…but for the second week in a row, the boys from Houston shocked me again and took the Skins into overtime to beat them on a game winning field goal 30 to 27. Okay, so now on to my personal favorite game of the week…the Colts hosting the Giants in the “Manning Bowl.” It came as no shock to me, but the Colts bounced back after their loss to the Texans last week and got back to their usual ways and just simply put the smack down on the Giants 38 to 14. Last, but certainly not least, we saw the 49er host the Saints. It nearly became my upset of the week as the 49ers, who were down by 8 with just over 2 minutes to play, marched down the field in 53 seconds to score the TD and also convert for 2 to tie things up with just over a minute left. The Saints then managed to march themselves down the field as well and set up Garrett Hartley for a 37 yard game winning field goal as the Saints won this one 25 to 22 and improved their record to 2-0. Although the 49ers lost this one, it turned out they may have been the karma enforcers from USC as Reggie Bush had to leave the game early with what could be a broken leg. 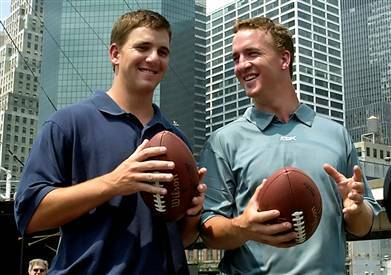 The biggest game had to be the battle of the bro’s -- The Manning Bowl. All though Peyton Manning usually takes care of his little brother and the Giants, this certainly was not going to be a sure win after losing to the Texans last week. However, the Colts bounced back and took down the Giants with no problem and won the game 38 to 14, proving to the rest of the football world that they are still one of the best teams in the NFL. The biggest letdown has got to be my personal favorite, Brett Favre and his Minnesota Vikings. After all the hype and the Superbowl talk, you have to wonder, after throwing 3 interceptions, if #4 has finally ran out of greatness. Although I don’t believe he has, after this past Sunday, you have to wonder. I mean the Miami Dolphins…really? Although I believe granddaddy Favre still has it, he and his Vikings are going to have to figure out something and do so quickly. The Vikings are now a surprising 0-2. The biggest upset for me had to be the Jets spanking the cockiness right out of Tom Brady and the Patriots. I really thought the Patriots would have no problem with the Jets, but the Jets proved me to be way off with my predicted 30 to 17 win for the Patriots. The Jets easily won this game 28 to 14 and can now possibly be put back in playoff conversations. The question now is can they shut their mouths and continue to play football? So for the second week in a row, my biggest surprise goes to the Houston Texans for beating a quality team in back-to-back weeks with the Colts last week, and the Redskins this week. After “icing the kicker” from the Redskins as they had a chance to win the game in overtime on a 52 yard field goal, the Texans got the ball back and marched down the field to set up a 36 yard game winning field goal. The Texans won this game 30 to 27 and improved to 2-0. Well, that wraps things up for me as I once again patiently wait for week 3 in the NFL.